Timmy Time follows the adventures of Timmy, a little lamb with a lot to learn as he enters preschool. Fans of Aardman’s hit children’s series Shaun the Sheep will recognize Timmy as the baby lamb on the farm who is frequently drawn into all kinds of chaotic adventures by the mischievous older sheep. Used to having his way by being “the only lamb in the flock,” Timmy is now heading to preschool to graze on some important life lessons about playing nicely with others, namely his fellow classmates of the furry, feathered and spiky types. Whilst bossing everybody about during rehearsals for the nursery’s talent show, diva Yabba loses her voice! Yabba is crestfallen that she may not able to perform, but Timmy saves the day by performing for her. The class is off on a picnic! But during a game of football, the ball bursts on Apricot’s spikes. Apricot feels guilty that the little animals no longer have a ball to play with, but soon finds a good use for her prickly spikes – picking up the picnic litter! Apricot has brought her favourite blanket to the nursery – which she will not let go! But when she briefly puts it down – the other animals mistake it for a rag which they use to clean up paint and mud. Timmy tries to console Apricot with substitutes, until he discovers a pleasant surprise in Stripey’s sand pie! Led by Harriet and Osbourne the class are exploring various dance styles, from hula dancing to line dancing. But Timmy just cannot get into the groove! He soon discovers a passion for hip-hop music and wows his friends with his break-dancing moves. Timmy accidentally kicks a football through the nursery window! After a stretch on the naughty stump, he tries to be more careful, but ends up knocking down Otus’ sandcastle with a careless kick of the ball. After much soul searching, Timmy realizes it’s not enough to say sorry, you have to show you’re sorry too. 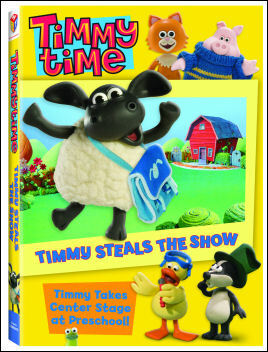 Timmy Time Steals the Show will be out on DVD on February 22, 2011.